This page documents data for Adams & Adams (1857), such as genera and species attributed to that publication (including known misspellings, misidentifications, and other unavailable names) as well as taxonomic opinions, if available. Taxonomic opinions refer to uses of genera and species as valid and invalid in that work. Adams, H. & A. Adams. 1857. The Genera of Recent Mollusca; Arranged According to their Organization 2: 489-511. Say, 1819, Nich. Encyc. 4: . Say, 1825, Jour. Acad. Nat. Sci. 5(3-4): 131. Férussac, 1827, Bull. Sci. Nat. et Géol. 10: 417. Lea, 1829, Trans. Amer. Phil. Soc. 3 [O. 1]: 421. Ferussac, 1835, Mag. Zool. 5: 25. Lea, 1836, Synopsis Fam. Naiades: 43. Agassiz, 1852, Arch. Naturg. 18(1): 46. Adams & Adams, 1857, Gen. Rec. Moll. 2: 499. Vest, 1866, Verh. Mitth. Siebenbürg. Ver. Naturw. (17): 197. Sowerby, 1868, Conch. Icon. 16: pl. 1. Menke, 1828, Syn. Method. Moll. : 58 [as ‘Mülleria’]. Menke, 1830, Syn. Method. Moll. : 98 [as ‘Mülleria’]. Herrmannsen, 1847, Ind. Gener. Malacol. 2: 61 [as ‘Mülleria’]. Philippi, 1853, Handb. Conch. Mal. : 533. Adams & Adams, 1857, Gen. Rec. Moll. 2: 511 [as ‘Mülleria’]. Agassiz, 1852, Arch. Naturg. 18(1): 52. Mörch, 1853, Cat. Conch. Yoldi 2: 44. Adams & Adams, 1857, Gen. Rec. Moll. 2: 496. Agassiz, 1852, Arch. Naturg. 18(1): 45. Mörch, 1853, Cat. Conch. Yoldi 2: 46. Mörch, 1853, Cat. Conch. Yoldi 2: 48. Adams & Adams, 1857, Gen. Rec. Moll. 2: 502. Martens, 1900, Biol. Centr.-Amer., Moll. : 481. Deshayes, 1854, Cat. 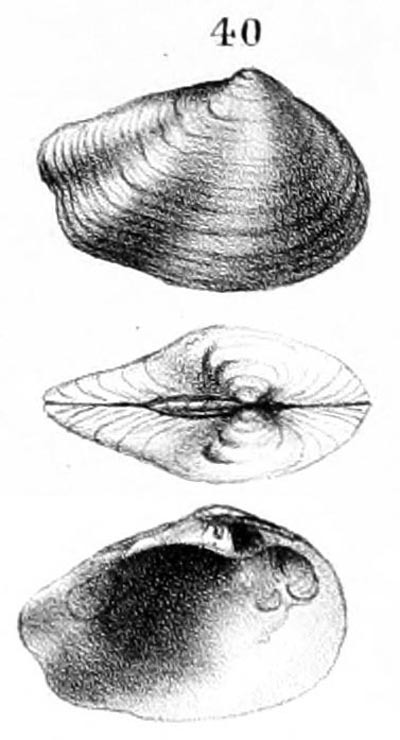 Bivalves Brit. Mus. part 1: 240 [as ‘Cyrenodontæ’]. Adams & Adams, 1857, Gen. Rec. Moll. 2: 453. Adams & Adams, 1857, Gen. Rec. Moll. 2: 165, 451. Adams & Adams, 1857, Gen. Rec. Moll. 2: 522. Adams & Adams, 1857, Gen. Rec. Moll. 2: 651. Bory de St. Vincent, 1827, Encycl. Méth. 2: 147. Lea, 1834, Trans. Amer. Phil. Soc. 5 [O. 1]: 93. Adams & Adams, 1857, Gen. Rec. Moll. 2: 504. Ihering, 1893, Arch. Naturg. 59(1): 135. Corsi, 1900, Anais Mus. Nac. Montevideo 2: 456. Marshall, 1915, Proc. U.S. Nat. Mus. 49(2122): 529. Haas, 1929, Senckenbergiana 11: 340. H.B. Baker, 1930, Occ. Pap. Mus. Zool. Univ. Mich. (210): 70. Morretes, 1949, Arqu. Mus. Paranaense 7: 27. Adams & Adams, 1857, Gen. Rec. Moll. 2: 491. Haas, 1952, Nautilus 65(4): 118. Clench & Turner, 1956, Bull. Fla. State Mus. 1: 187. R.I. Johnson, 1970, Bull. MCZ 140(6): 362. Heard, 1975, Malacologia 15(1): 84. Kat, 1983, Malacologia 23(2): 362. Hoeh, 1990, Malac. Review 23: 63. Lydeard et al., 1996, Philos. Trans. Roy. Soc. London (B, Biol. Sci.) 351: 1595. Rosenberg et al., 1997, J. Moll. Studies 63: 303. Adamkewicz et al., 1997, MBE 14(6): 622. Adams & Adams, 1857, Gen. Rec. Moll. 2: 494. Haas, 1940, Zool. Ser. Field Mus. Nat. Hist. 24: 140 [as ‘Caelatura egyptiaca’]. Araujo et al., 2017, Zool. J. Linn. Soc. 179(2): 280. Lea, 1840, Proc. Amer. Phil. Soc. 1: 288. Lea, 1842, Trans. Amer. Phil. Soc. 8 [O. 3]: 222, pl. 18, fig. 39. Adams & Adams, 1857, Gen. Rec. Moll. 2: 501. ‘Humphrey’ Swainson, 1840, Treat. Malacol. : 284, 379, footnote. ‘Humphrey’ Adams & Adams, 1857, Gen. Rec. Moll. 2: 509. Adams & Adams, 1857, Gen. Rec. Moll. 3: pl. 120, figs. 2-2a. 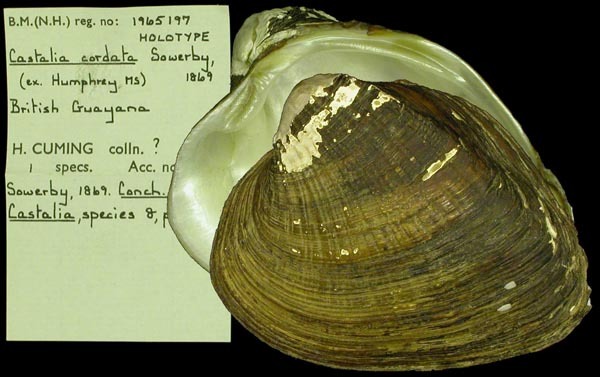 Type(s): HOLOTYPE BMNH_1965197, British Guayana. Conrad, 1853, Proc. Acad. Nat. Sci. 6: 256. Adams & Adams, 1857, Gen. Rec. Moll. 2: 497. Reeve, 1864, Conch. Icon. 16: pl. 9, sp. 33. Call, 1895, Trans. Acad. Sci. St. Louis 7: 21. F.C. Baker, 1898, Bull. Chicago Acad. Sci. 3(1): 83, pl. 25, fig. 1; pl. 12, fig. 2. Simpson, 1900, Proc. U.S. Nat. Mus. 22: 776. Call, 1900, Ind. Dept. Geol. Nat. Res. (1899): 489. Ortmann, 1910, Nautilus 23(11): 140. Ortmann, 1910, Nautilus 23: 116. Ortmann, 1912, Ann. Carnegie Mus. 8: 253. Ortmann & Walker, 1922, Occ. Pap. Mus. Zool. Univ. Mich. (112): 14, 16. F.C. Baker, 1928, Bull. Wisconsin Geol. Nat. Hist. Survey 70(2): 84. R.I. Johnson, 1980, Bull. MCZ 149(2): 90. Lea, 1842, Trans. Amer. Phil. Soc. 8 [O. 3]: pl. 18, fig. 40. Agassiz, 1852, Arch. Naturg. 18(1): 47. Conrad, 1853, Proc. Acad. Nat. Sci. 6: 263. Sowerby, 1868, Conch. Icon. 16: pl. 63, sp. 319. Simpson, 1900, Proc. U.S. Nat. Mus. 22: 661. Haas, 1969, Das Tierreich 88: 395. Adams & Adams, 1857, Gen. Rec. Moll. 2: 493 [as ‘Unio (Hyridella) bucklyi’]. Lea, 1870, Synopsis Fam. Naiades: 48. Deshayes, 1854, Cat. 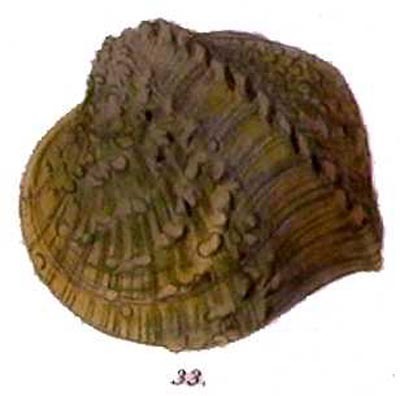 Bivalves Brit. Mus. part 1: 232. Adams & Adams, 1857, Gen. Rec. Moll. 2: 447. ‘Lea’ Adams & Adams, 1857, Gen. Rec. Moll. 2: 494. ‘Lea’ Adams & Adams, 1857, Gen. Rec. Moll. 2: 497. ‘Lea’ Adams & Adams, 1857, Gen. Rec. Moll. 2: 503. ‘Mousson’ Adams & Adams, 1857, Gen. Rec. Moll. 2: 447. Lea, 1870, Synopsis Fam. Naiades: 31. Singley, 1893, Geol. Surv. Texas (1892): 317. ‘Recluz’ Adams & Adams, 1857, Gen. Rec. Moll. 2: 502. Anodonta (Lamproscapha) solidula Dev. & Hup. 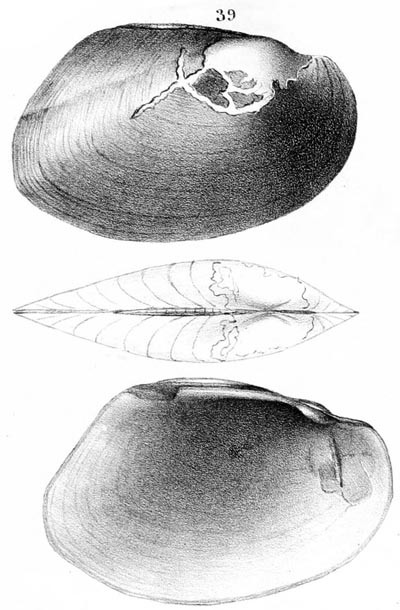 Anodonta (Patularia) trapezialis [sic] Lam. Unio (Hyridella) egyptiacus [sic] Caill. Unio (Lampsilis) orbignyii Dev. and Hup. Unio (Niäa) litoralis [sic] Drap.